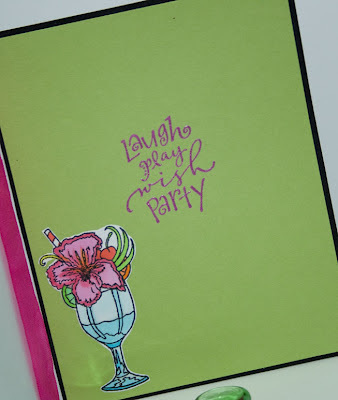 Hi Stampers and welcome to the Flower Power Blog Hop....if you came here from Marie you are in the right place, if not you might want to start at the beginning and find out how you might win some free stamps!! I did two cards using my Pazzles Inspiration to start with. The first card is a flower shape card and I cut out the layer in white, then using inspiration from the Time to Zentangle book, I tangled the flower then used my Copics to color. For the center of the flower I embossed the sentiment and sparkled everything with Lavender Iris Glitter. You can see all the detail for the card here. You can find all the details to the card here. Thanks for stopping by and playing in the hop....the next on the list is Brenda! LOVE,LOVE the cut outs! Beautiful creations, Jill! What unique cards. The card with the Zentangle is really special and the 2nd card using the cutouts from the Pazzles is beautiful. Love the glittery look. Hot pink and hot teal!!! Two of my favorite colors :) What a fun set of cards!!! I'm torn to decide which is my favorite! So- I pick them both!!! Jill, great Spring colors, and your designs are really WOW! Great creative cards. I really love te flower shape. Love the shaped cards - that's one of my favorite ideas. Great colors - bright & bold. The hibiscus is my favorite - I'm a sucker for black accents & the glitter is awesome! I love the flower shaped card and all of the glitter! Two awesome cards Jill. Love the Zentangle effect on the first and the black just makes the pink flowers really pop! Great job. Jill, You have done a great job! I love the flower shape on the first card and the cut along the flowers on the second. I also love the design and layout of each. Both of your cards made me dream of a tropical vacation! The colrs are great. BeautifulI loved the shaped card. What a clever idea. Stunning cards-loving the cut-out and glittered flowers! What gorgeous works of art. I love them both. And, your glittering of the stencil card is perfect. I never can do that good of a job on mine. You must be the master of this technique. Thanks for sharing. My hop favorites, so far. I like the colors ( something about purple and green- taboo in the until the late 60's) and how you gave an unven cut to the cover., highlighting the flowers, and color matching the ribbon. It is a terrific smile evoking card. 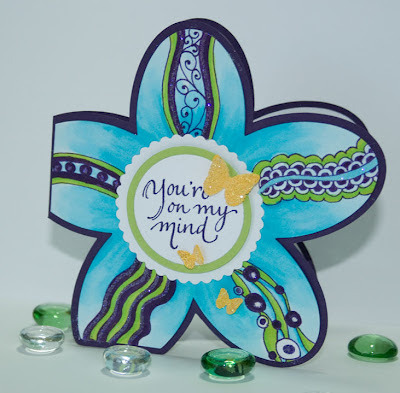 The turquoise card(again love purples) is adorable and amazing that you found time to really personalize with the zentangle. Both cards are wonderful, Jill, but the hibiscus flowers just grab me! I have to get that stamp set. Love all the glitter. Love these cards, Lots of creativity. Love the zentangle added in. Really great cards, Jill - admire your Zentangling very much! The shapes and colors are so springy! As usual, the beat in show. Love the shaped card and the Zentangle (LOL) The contrast on the second card is wonderful. Best teacher in South Shore. Super cards! I love shaped cards and yours a perfect. Thank you for sharing. Your cards are so pretty and creative. Love all the sparkle behind those cut flowers. Great job! I really like these. The glitter on the hibiscus looks amazing on the black background. Nice choice. Just goes to show you don't need to make a regular card. Love the flower shape and cutting out the second one with the Pazzels is beautiful. Colors are just right. I really love your cards. The hibiscus is my fave! I love your glittery lavender hibiscus. Great cards! 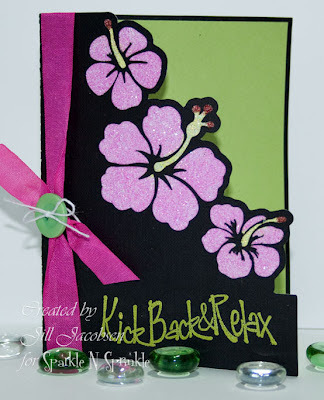 Love the colors, flowers on the Kick Back & Relax card. Jill your cards are the best!!! One a kind just like you!!!! Two bright, colorful, and very creative cards. I love both of them! Very colorful cards. I think the colors and cut-edge of the second is my fav. Beautiful cards, as usual, Jill! Especially love the shaped first card - so unusual! 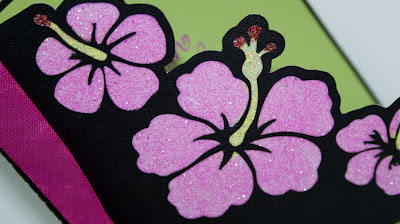 Lovely flower cards, Jill and great use of glitter.